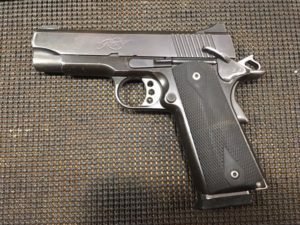 How to Perform a 1911 function and safety check. 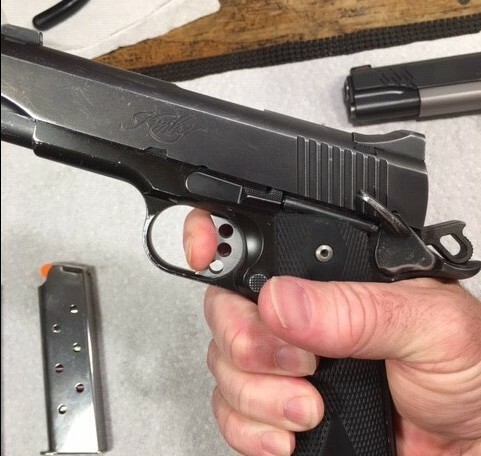 Anytime you disassemble or field strip your 1911 for cleaning purposes, recoil spring replacement, plunger tube replacement, upgrade, etc. it is necessary to perform a function and safety check. This is simply a series of steps to be sure that the gun has been assembled properly and the firearm safeties are working normally.. This tutorial will walk you step-by-step through a thorough mechanical function check. The checks in this tutorial are very thorough. There is more here than a safety check. 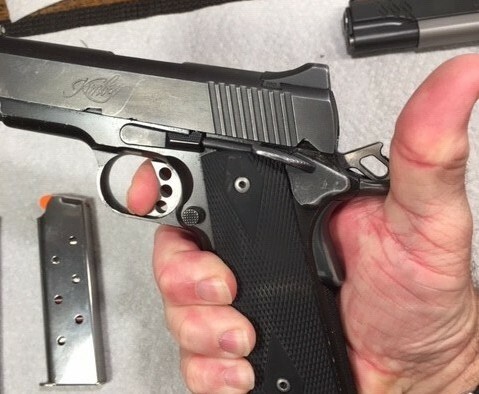 When you reassemble your 1911, it is advisable to at least do the safety checks. Steps 11-15 deal specifically with the thumb and grip safeties. This function check will be performed with the gun empty of live ammunition. Some of the steps will involve dummy rounds, which are simply fake ammo that has the same size and shape as real ammunition, but does not have any gun powder or primer. It is a comprehensive, yet quick verification to be sure all the safety functions work as designed. 1. 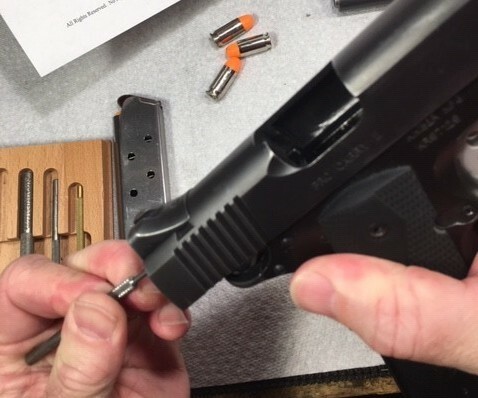 Take an empty magazine and insert it into the gun’s magazine well and verify the magazine catches and the magazine is securely held in place. 2. 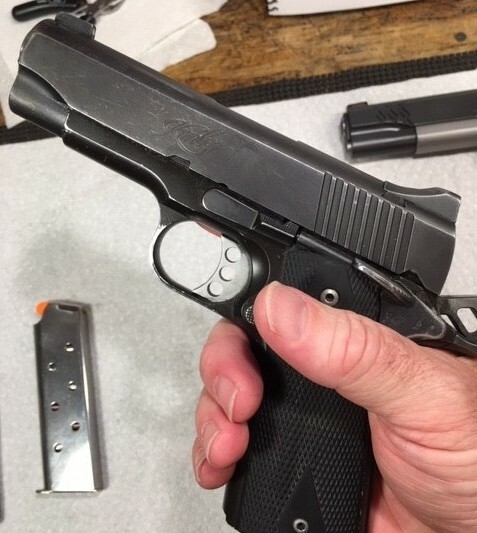 Make sure the thumb safety is disengaged and rack the slide all the way to the rear and make sure the slide stop lever engages the slide stop notch and holds the slide all the way in the rearward position. 3. Make sure the slide stop lever is all the way up into a slight stop not as far as it will go. 4. Remove the empty magazine using the magazine release button. 5. Rack the slide to the rear to release the slide stop lever and allow the slide to move all the way forward. 6. Do a press check or chamber check to verify once again that the gun is unloaded. 7. Press the trigger and hold it to the rear. The hammer must snap fully forward. 8. While continuing to hold the trigger all the way to the rear rack the slide. Hammer must remain in the fully cocked position. 9. Allow the trigger to slowly come forward until you feel the click of the trigger reset and then press the trigger again. The hammer must fall fully forward at this point. 10. 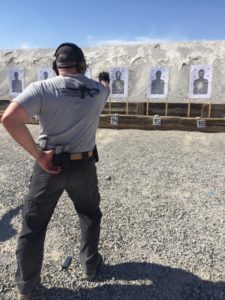 Take your finger off of the trigger and rack the slide. The hammer must remain in the fully cocked position. 11. 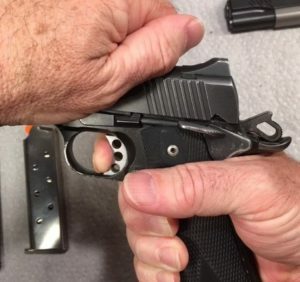 Move the thumb safety into the safe position and attempt to press the trigger. The hammer must remain fully cocked. 12. Place the thumb safety back into the downward or fire position. The hammer must remain fully cocked. 14. 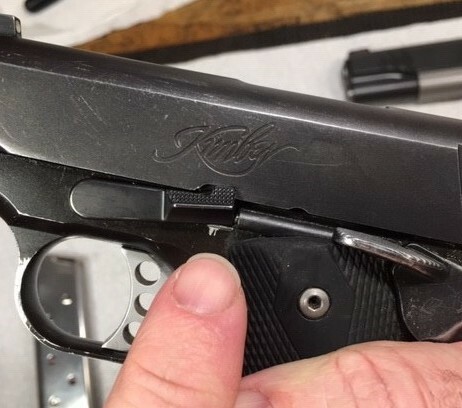 Reestablish a correct firing grip and using your support side hand, retract the slide slightly, about one half inch and hold it there. 15. Press the trigger. The hammer must remain fully cocked. 16. Place an empty magazine fully into the magazine well and ensure it clicks in place. 17. Depress the magazine release and the magazine should drop out of the gun. 18. Load a magazine with DUMMY ROUNDS. 19. Insert a magazine that is fully loaded with DUMMY ROUNDS into the gun and ensure it clicks into place. 20. Once again, depress the magazine release and the magazine should drop out of the gun. 21. Insert the magazine containing the dummy rounds again. 23. 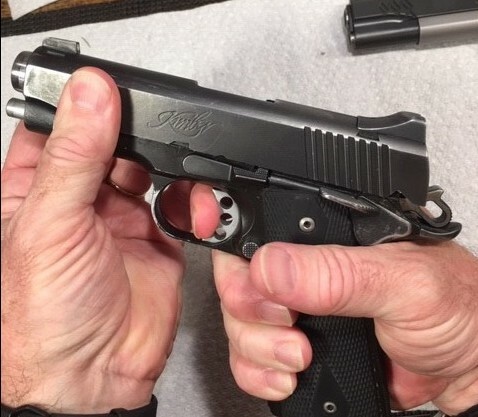 Slide should close fully under its own recoil spring power. 24. Rack the slide again. 25. A dummy round should be ejected from the ejection port and a new dummy round should be stripped off of the top of the magazine and fully chambered. 26. 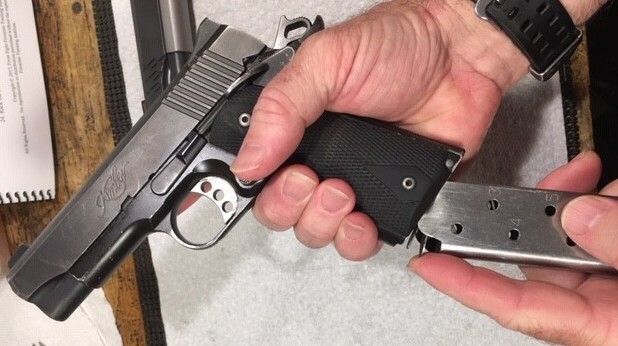 Continue racking the slide to simulate shooting the pistol and one by one, the dummy rounds should all be ejected until the magazine is empty and the slide locks back on the empty magazine. 27. Proceed to do this using every magazine you intend to use with the gun. 28. 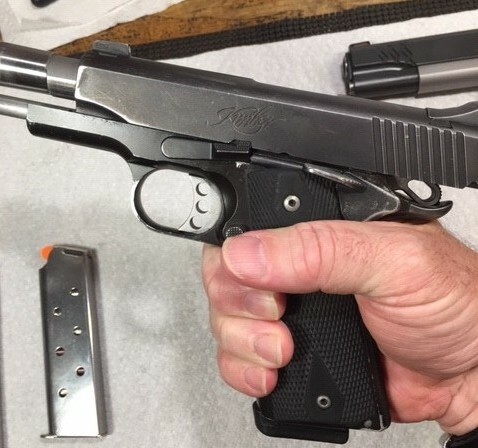 Guns equipped with a firing pin safety feature (Colt Series 80 or later 1911s) have one more check. Lock the slide back, and take a small punch and press on the rear of the firing pin. 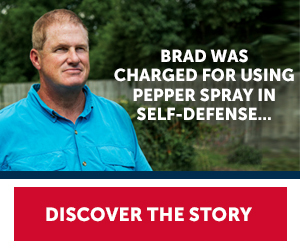 Be sure it stops before protruding into the chamber through the breech face. 29. 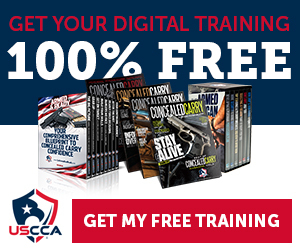 Go to the range and test fire the gun. As you can see, there are a lot of steps, but if you go through it a few times, you will have it down. It is basically just a quick test of all the functions and safeties. 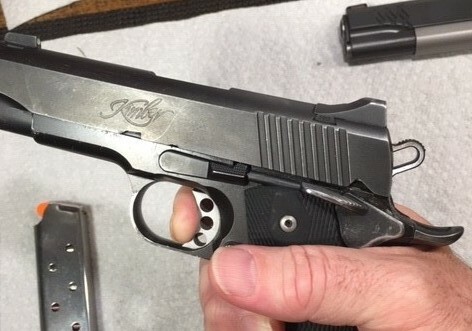 This completes the 1911 safety and function check. If all went well, your gun is ready to go! Please leave comments, questions or suggestions in the comment section below.